"Dear God, I would like to apply for the (#9) darkness or the (#2) frogs or (#8) locusts instead. Thank you." Already, I've doused my kids' heads with tea tree and lavender essential oil, Campho-Phenique, Listerine and Cetaphyl cleanser. These treatments are old wives' tales (OK, one gal was in her early 30's) and they didn't work for me, but my children now smell delightful. 1. Lice are never ready for their close-up. Whatever you do, NEVER look at a picture on the Internet of a single louse under a microscope. You will either shave your child's head or send her to boarding school for six months so THEY can deal with these monstrous, grotesque gargantuan inhabitants. 2. The machinery is intense. 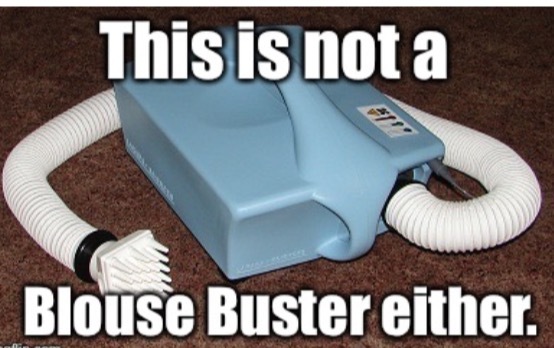 There is something called a LouseBuster which will make you look twice, thinking it says, "SpouseBuster." It doesn't, but it should. 3. There are professionals in the field. There are people who get rid of lice for a price. I amused myself thinking up names for their businesses while I waited for them to go through every strand of my children's hair with a "Nit-onator" comb. The salon was simply called, "The Nit-Picker." How dull. How about "The Lice Whisperer," or "Sugar & Spice & Everything Lice," or "Tip of the Liceberg," or "Once bitten, Lice Shy," or "Breaking the Lice," or "At Nit's End," or "Nit's a Small World After All," or "Playing Nit By Ear," or "A No-Win Nituation," or "Laying Nit On The Line," or "Like Nit or Lump Nit," or "I wouldn't touch Nit with a Ten-Foot Pole," or "Get Over Nit," and my personal favorite, "When The Nit Hits The Fan." Who needs to write for The Huffington Post? I'll just sit around and name parasitic petulance companies all day long. 4. They have enviable longevity. Because live lice and nits cannot live without their host scalp for longer than 48 hours, you don't have to clean your home, you just need to starve it of humans. Move to a new residence! 5. It leads to The Blame Game. Stay in offensive mode when you report this experience (and you really should!) to the parents of your kid's friends. Insist that it's their unkempt child who gave it to your precious tot in the first place. Don't back down on this one, trust me. 6. They make you a temporary neat freak. You will never clean your house as thoroughly as you will after a lice infestation. And by "you," I mean your spouse. 8. They induce paranoia. If you go to your child's pediatrician for the initial diagnosis (because you're confused about identifying a nit from a piece of dandruff) and the Dr. suddenly says, "Oh wow, her scalp is just teeming with them. Come closer, Mom -- let me educate you on what they look like," and you run from the examination room screaming, "Teeming? Teaming?! Who SAYS that?" Expect the physician to make notes in your child's file about their mother's stability. 9. They bestow an aura of mystery. If you want to capture someone's attention, walk into Target and ask the clerk, "On what aisle would I find products to kill..." then whisper the rest in her ear. Ten people will follow you around the store. 10. They stir controversy. If you keep your child home from school, the head lice have won! Seriously, just write a post saying you sent your kid to school with a full-blown, active case of lice. Save this blog for April Fool's Day. 11. They elicit drama. When the lice problem finally goes away (and it will!) you will be reduced to your best Scarlett O'hara impersonation, dropping to your knees on old shag carpet, holding up the empty casing of a nit while shouting to the heavens, "As God as my witness, I'll never be itchy again!" And now, since my home is so clean you can eat off the floor, I'm issuing a formal invitation for you to come for dinner tonight. Just don't show up empty-handed. That's a pest-peeve of mine.